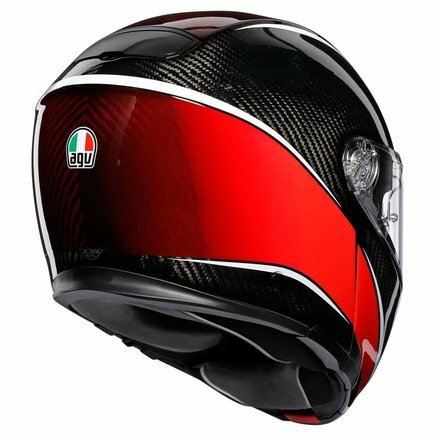 Agv Sportmodular Tricolore Matte Carbon / Italy Helmet. The Sportmodular is the new, top of the range, modular helmet from AGV, affording the performance of a full face helmet with the comfort of a modular helmet. 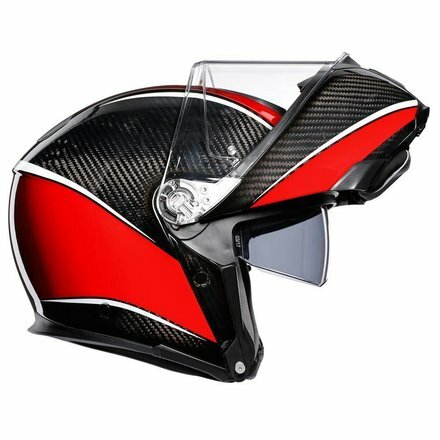 The 100% carbon fibre outer shell affords the same features as the Pista GP R. With a wraparound, pressure free interior, reversible padding on the top part with a warmer and a cooler side, in order to adapt at all times or the rider’s needs. 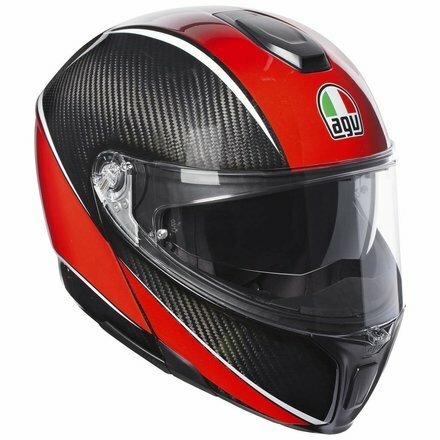 It also has an integrated sun visor, as well as an efficient built in IVS ventilation system. Outer shell (outer structure) is made 100% of carbon fibre. 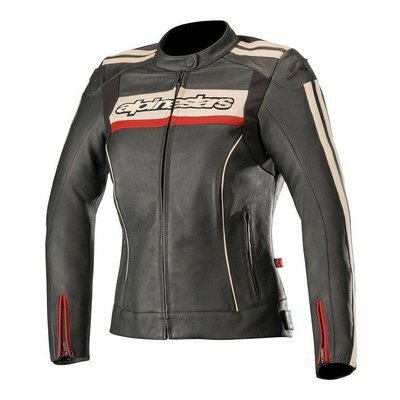 Available in 3 exterior sizes to fit the physical constitution of each rider (XXS-M), (L-XL), (XXL-XXXL). The interior has EPS (interior structure) of 5 densities for optimum impact absorption. Its structure is extremely compact and light with unequalled safety features. 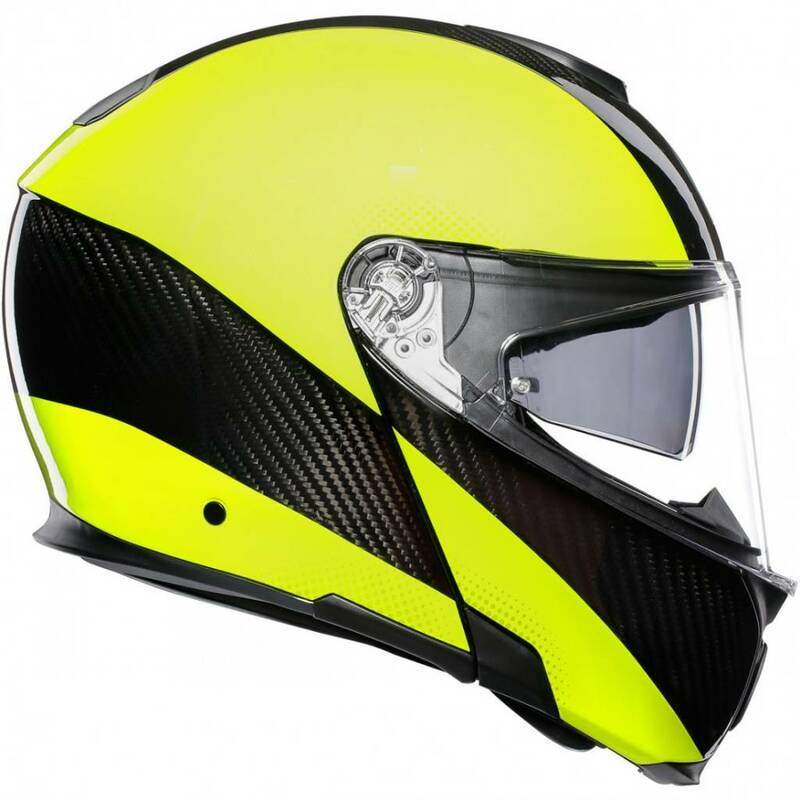 The shape of the helmet has been designed to favour the aerodynamic efficiency and to minimise the risk that the energy generated by an eventual impact is transmitted to the clavicle area. Metal chin bar opening mechanism which avoids its accidental aperture. The IVS ventilation system consists of two air inlets (one on the upper part and the other in the chin bar) and 1 rear exhaust. 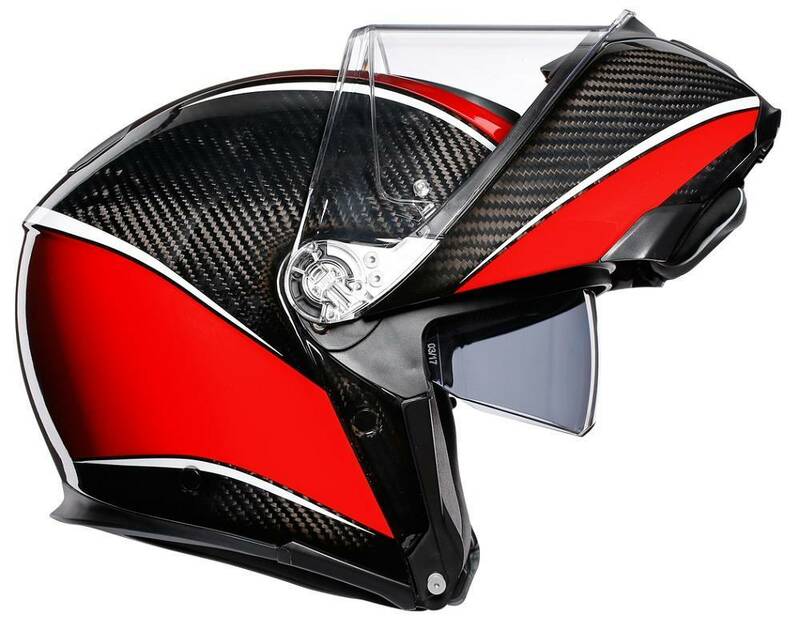 The ventilation of the upper front part has been strategically placed in order to receive the greatest air flow directly to the head. New internal ducts in the chin bar that help distribute the airflow uniformly throughout the screen’s surface. The wind tunnel tested, rear spoiler affords high aerodynamic efficiency and stabilises the helmet at high speeds. The interior has been designed to afford a stable, wraparound and pressure free fit in order to minimise the noise inside the helmet, as well as for maximum comfort. With Sanitized treatment (anti-bacterial), 2Dry (for superb moisture wicking) and Microsense (for a soft, comfortable feel). 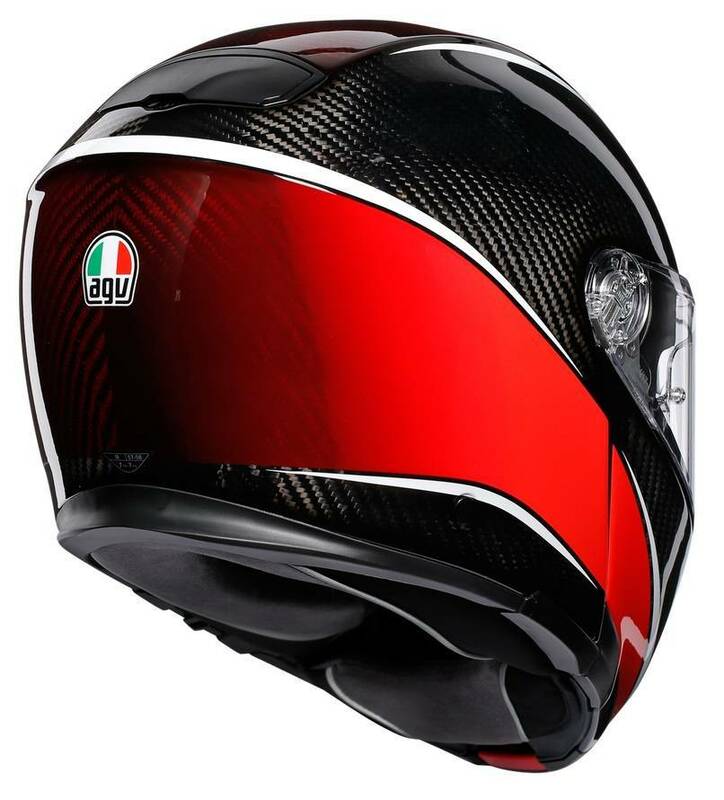 The padding of the upper part has been patented and is reversible: with a warmer side and a cooler side, in order to adapt to the rider’s needs at all times. 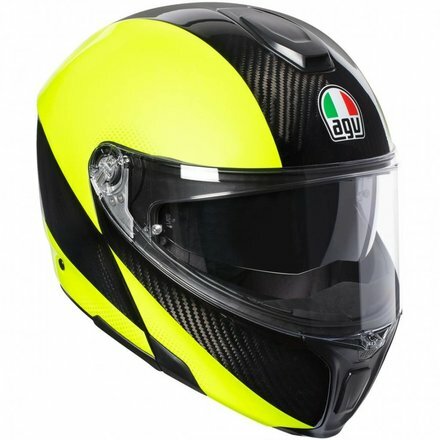 The neck area has a water resistant treatment to stop water getting into the helmet. The interior is fully removable and washable. The side padding design has been optimised for prescription glasses. 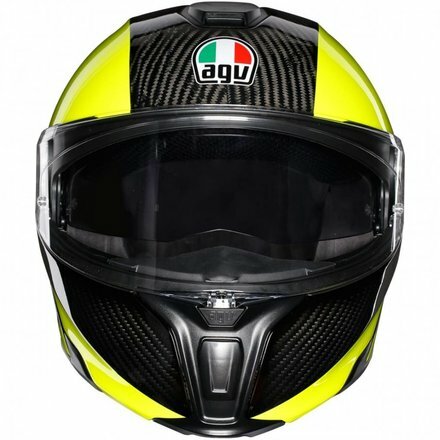 Removable chin curtain and breath guard. The new, class 1 optics, anti-scratch screen has been designed to afford an 85 degree vertical field of view in the racing position and 190 degrees of horizontal vision. Includes Pinlock 100% MaxVision (120). Clear screen GT3-1 (Sizes: XXS-L) and GT3-2 (Sizes: XL-XXXL) with anti-scratch treatment. Built in sun visor with anti-scratch treatment; easily removed without tools. The screen incorporates a patented closure system (VLS) which avoids accidental opening. The screen mechanism allows for tool less extraction and has metallic parts for greater strength. Weight: 1295 g +/- 50g (in sizes XXS, XS, S and M).